I also think that we made a big mistake in announcing that we were going to cycle around Britain, albeit with the added word, ‘probably’. I thought that strap line was terribly witty and really summed up our care-free, relaxed attitude to the whole trip. Of course, I was kidding myself wasn’t I? Just as I said in the blog about giving up drink for January, making that announcement is great if you want pressure to achieve something difficult. Fatal if you don’t. So, lesson number two; don’t pick any journey that is of a circular nature if you don’t want commitment. Any circular trip has a very obvious beginning and end and most people would notice if you did half a circle and then made a bee-line for home. In other words, a circular journey has ‘failure’ written all over it if you don’t complete the circle. We really, genuinely believed that we were above all that stuff and that we could make up our own rules. That it really didn’t matter if we decided to miss out bits of Scotland or save Wales for another time. In reality though, the pressure to ‘do the whole coast’ was huge. So, lesson number two; keep things open ended, literally. I’ll give you a specific example of what I think I did wrong. I say I, rather than we, because I actually do think that I was much more to blame for this than Gill. 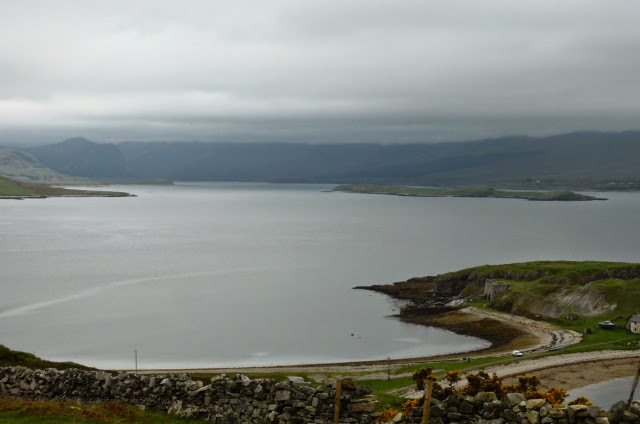 We had a glorious ride one morning around Loch Eriboll. The whole day is covered in this post: Skerry Wild Camp. The scenery was spectacular and even the occasional shower of drizzle couldn’t dampen our mood. As you complete the circuit of the loch there is a pretty steep climb and then a spectacular ride down through wild country before an even tougher climb at the head of Loch Hope. 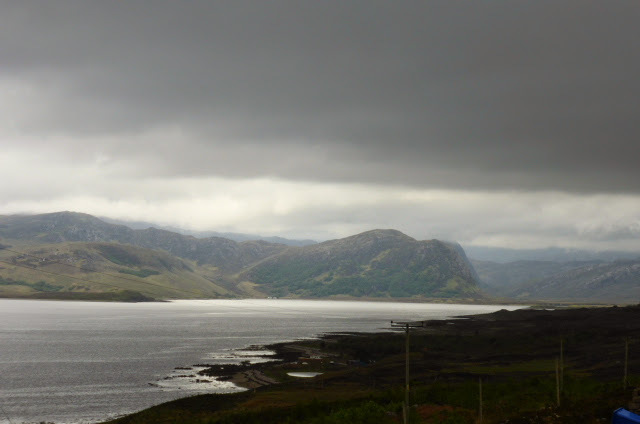 As I tackled this next climb, and it really was a brute, I glanced over my right shoulder and caught a glimpse of the loch lit by a shaft of sunshine amidst a brooding dark background of towering hills and black skies. It was a breath taking scene but I had no breath to give. Preoccupied as I was with completing the climb I looked for only a fraction of a second and I recall thinking as I pushed on how it would have made a fabulous photograph. Did I stop? Did I take the opportunity to capture something really special whilst also having a quick breather? No I didn’t. I let the climb consume me completely and only when I reached the top and the loch was completely out of sight did I stop to catch the breath that I kept from the scene. I will always regret that moment because already the sharpness of it is fading. If only I had stopped and really taken it in. Etched it more permanently on my mind like an indelible tattoo to savour for ever more. I let the challenge of a physical achievement outweigh the beauty of a moment that might have fed my soul forever. It’s easily done and to some extent that’s what we did with the whole journey. As I said, I think I was more to blame for this than Gill. We have over two thousand photos from the trip but as I have been going through them adding captions and locations I am bitterly disappointed to find that I can’t place many of them. It takes a huge effort of recall, aided by maps, notes and Google Street Map to pin down the exact location and bring to mind how I felt at the time. Sometimes, sadly, I just can’t remember. We have had the first tentative conversations this week about future tours. We don’t have any plans for where to go. When, or for how long even. All we know right now is that in future we will get on our bikes with the sole intention of really seeing somewhere. Seeing it with our eyes, our ears and our hearts and our minds. Seeing it slowly and intensely, however long that takes. We might put a duration on it. A month, two months or whatever but we won’t put a distance on it and it definitely won’t be circular.